CORRECT WAYS TO WASH YOUR FAVORITE FRUITS AND VEGETABLES! Most of the people eat their veggies and fruits raw or half-cooked, yes its healthy, but not all of us are aware that there is a proper way to wash this fruits and vegetables. Organic fruits and vegetables are more preferable but its also more expensive than the usual non organic ones. Not everybody can afford that so, this article will teach you on how to effectively wash what you eat and avoid those harmful pesticides from going inside our body. The Department of Agriculture of USA conducted a study and found out the almost 65% of the specimens (fruit and veggies from the market) are positive with pesticides. According to Centre for Science and Environment (CSA), "high levels of pesticides residues can be toxic enough to cause long term cancer, severe disruption of immune system, birth defects, damage to the nervous system and reproductive system." Soak the fruits and vegetables in a hot water for a couple of minutes. 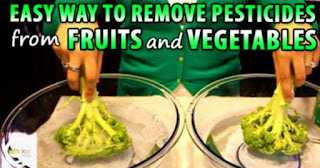 Peeling is also recommended because most of the pesticides are found in the skin of the fruits and vegetables. Combine 1 part vinegar and 3 parts whites vinegar and spray on your chosen fruit or veggies. Rub gently with a comb or something that is a little bit rough then rinse with water. Combine water with salt then used this to wash your favorite fruit and vegetables. Almost 80% of the pesticides residues are removed if you use cold water. We all want to live healthy, let us start with the way we prepare our food.